Rosh Hashanah begins at sunset tonight. A sweet New Year to you too. Hey FaRaDaY, Hey Maxwell, Hey Allie, Jetty here. Hi Mom. I don' t know what it means but it sounds nice so i'm saying it too. A common greeting we use is L'shanah tovah ("for a good year"). Happy New Year! What do kitties get to celebrate, since we can't taste sweet? May all your family be written into the book of life for the coming year! L'shanah tovah to you too!! A very good New Year to you too, looking forward to 5773. Oh Dog! I don't know the correct greeting to offer, but Happy New Year! How lovely! Shana Tova Umetukah! Purrs! And a sweet new year to you too! A Sweet and Blessed New Year to you! Good yom tov. A wonderful holiday, by me. Always a very big deal. It really does feel like the year turns in my world. So nice to share it with you. Oooo honey and apple. That looks delish! 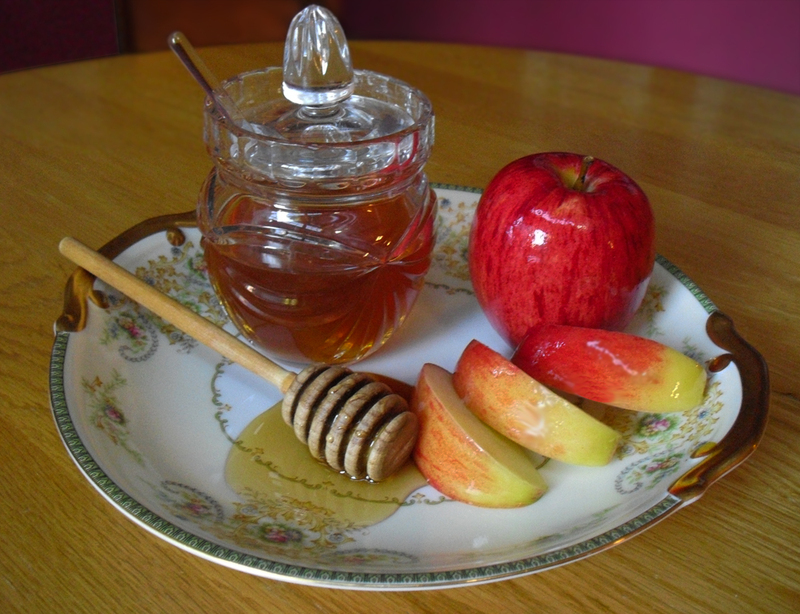 Happy Rosh Hashana to you! Super interesting! ...Glogirly grew up in CA and her dad found rattlesnakes in their garage and yard a couple of times. VERY scary!!! And one time when she lived in Houston she went to the garage to ride her new tricycle she'd gotten for Christmas, hopped on and grabbed the handlebars. One handlebar was bigger, warmer and had a SNAKE coiled around it. It was quite the freak-out. Glad I didn't witness the calamity that ensued.